I have been trying to create a bouquet from the flowers in my garden each week, but this week I am between blooms and didn’t think I would be able to create a bouquet. 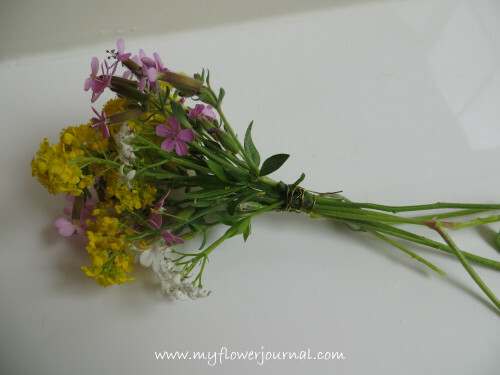 Then the idea came to make a mini bouquet-one just the right size for a garden fairy. More ideas came and I couldn’t wait to get started. I made 4 mini bouquets using a variety of flowers with a thimble and caps from bottles for the vases. The smallest arrangement is in the thimble vase. It is 2 inches tall. The others are 2 1/2 -3 inches tall. 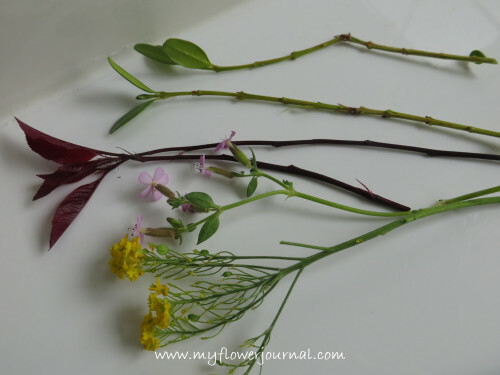 First gather a variety of flowers and leaves, cutting the stems as long as you can. I used Soapwort, Snow in the Summer, Lobelia, Sweet Woodruff, Basket of Gold, Lavender, Boxwood and Flowering Plum. Some other flowers that would work well are Forget-Me-Not, Lilly of the Valley, Creeping Phlox, Aubretia and Alyssum. 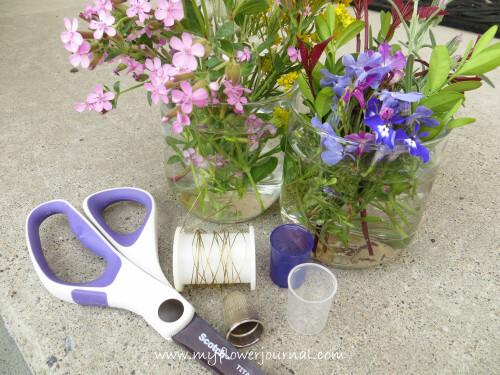 You will also need very, very fine gauge wire, scissors and “vases”. 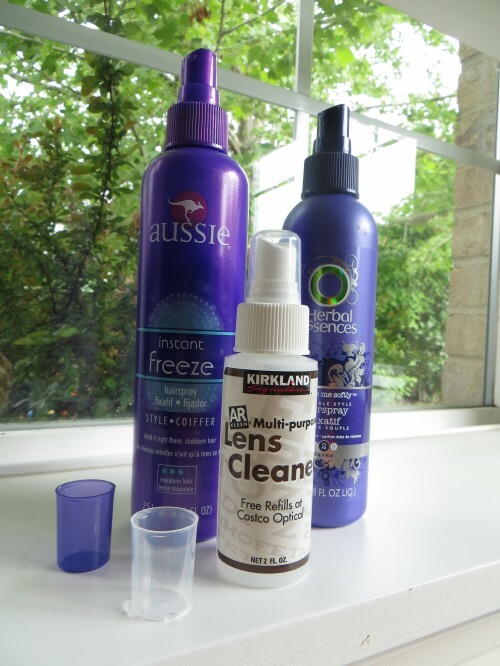 I used the caps on these hairspray and lens cleaner bottles for my vases. Clean all the flowers and leaves off the lower part of the stems. 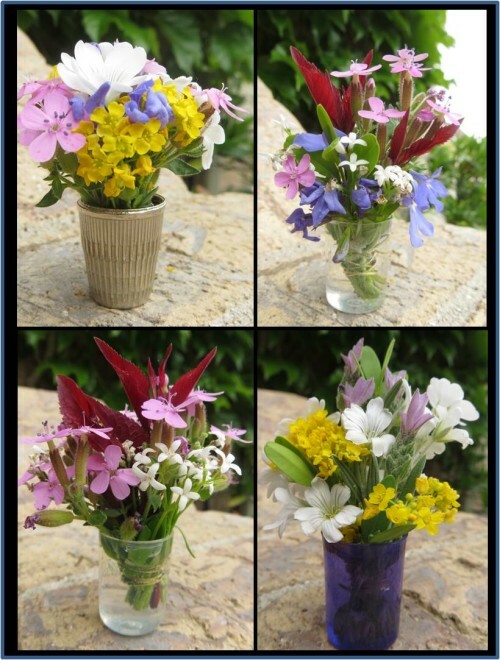 Arrange the flowers and leaves in a pleasing way. Then wrap the stems with a 4-6 inch piece of very light weight wire. After you wrap the stems with wire cut them so the bouquet will fit in your vase filled with water. Wrapping the stems keeps the flowers together and makes it easier to change the water in the vase. The mini bouquets will last for several days if you check the water in the vases morning and night and keep them filled with water. You will be amazed how quickly the water can disappear in these little vases! 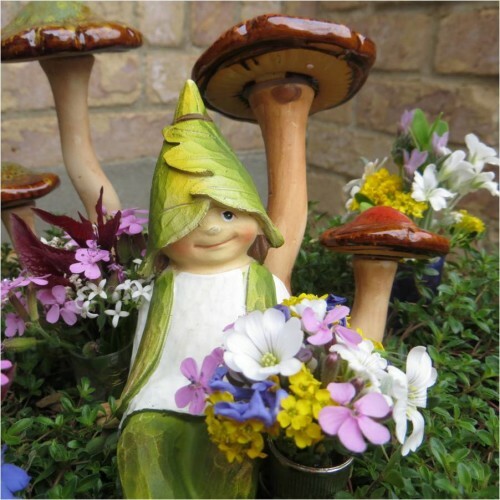 Share the mini bouquets with your favorite garden fairy or place them on your kitchen windowsill for everyone to see. These mini bouquets would also make cute party favors! Visiting from Tootsie time. What a cute mini bouquet for the garden fairy! The mini bouquets turned out darling. Thanks for linking up with us!